Missouri law gives parents certain rights and responsibilities as to the care of their children. Among these is the responsibility for parents to provide financial support for their child or children. Child support orders may be imposed by the court in any proceeding involving a divorce, legal separation, protective orders, or one establishing paternity. In addition, child support can be ordered by the Missouri Family Support Division – Child Support Enforcement. While there are presumptive amounts of child support obligations set by law, the courts have discretion in determining the amount of child support that will be awarded in any given case. Child support can have a significant impact on your and your child’s financial situation, so it is extremely important that anyone who is party to a child support proceeding retain the services of an experienced St. Charles family law lawyer as soon as possible. To discuss your case with attorney Kenneth P. Carp, call our office today at (636) 947-3600. Because courts have discretion in the amount of child support they may award, it is advisable that anyone challenging or requesting child support payments retain legal representation. An attorney familiar with the law will be able to present your case in the best light possible, and may be able to secure a much more favorable result in your case than had you proceeded without representation. In addition, courts have the power to modify existing child support orders if either party can show a change in circumstances that would justify such a change. If you believe that you may be in this type of situation, you should discuss your case with a St. Charles family law attorney as soon as possible. 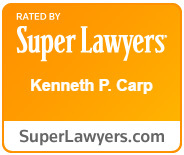 Kenneth Carp is a seasoned family law advocate who is committed to bringing his clients’ cases to the best resolution possible. To schedule a free consultation with Mr. Carp, call our office today at (636) 947-3600.